"Your Pom has less than 1 week to live," I examined the one-year rapid panting and gasping for breath open-mouthed Pomeranian with a pad wrapped around her backside. "If you can't help her to breathe normally." 2 days ago, the Pom coughed blood, splattering red clots onto the apartment's floor. Vet 1 had warded her and advised euthanasia a few times while the dog was treated past midnight, according to the owner. "Your dog would need to be hooked up permanently to an Oxygen mask," Vet 1 had said. 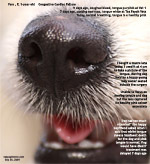 "Yet, I did not see the dog with the oxygen mask all the time during treatment," the boyfriend commented to me. I did not say anything as it was one side of the story. In the morning, Vet 1 discharged the dog while another Vet 2 from the same practice gave a second opinion and medication. Vet 2 said: "This dog will live from 1 month to 1 year." 48 hours later, I was consulted, being referred to by the owner's 2 friends. It was kind of Vet 1 to give the two X-rays of the heart to the owner so that there was no waste of time for second opinions. Even the Singapore General Hospital where I had a chest X-ray recently does not do release X-rays to the patient. "The vets said that this tablet will reduce the size of the enlarged heart." I shook my head. "Or stop it becoming more enlarged." I did not comment as there might be some mis-communication. I need to check this medicine out. The dog's heart was beating too fast. I passed the microscope to the Temasek Polytechnic Vet Technician intern so that he could hear abnormal heart sounds. "Can you hear the 'whooshing' heart sounds in the stethoscope?" I asked him. "Normal heart sounds are distinct." He nodded his head. I offered the stethoscope to the young lady. She declined. This was too stressful. The dog was about to die from heart failure soon. His tongue was purplish. However, I immediately gave an injection of 20 mg Furosemide from the one ampoule of Lasix IM in the left muscle of the thigh. There was hope. 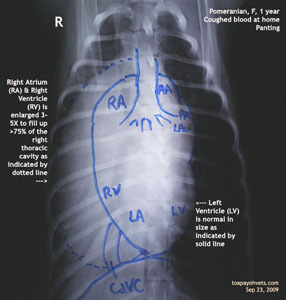 Then the dog was crated while I showed the lady pictures of the normal heart in X-rays from Vet Medicine text book. "Is it dangerous to the heart if the dog has more than 1 X-ray?" "No," I said. 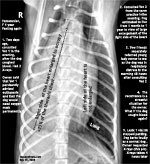 "Your dog had only 2 X-rays at Vet 1 and never had X-rays before." "Please take another X-ray," the lady said. I was surprised by this request. 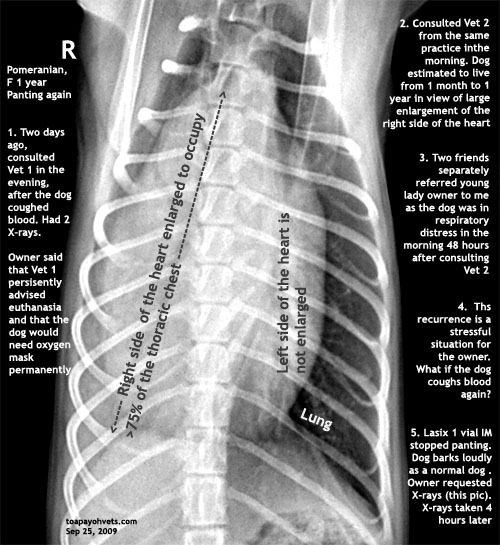 "The X-rays from Vet 1 are excellent," I advised that there was no need for more X-rays. However the lady insisted. It was 10 minutes after my Lasix injection. The young Pom was barking loudly and her breathing was normal. She passed out a lot of urine. Lasix had reduced the amount of water in the lungs by getting the kidneys to increase urine floe. The onset of diuresis is within 1 hour. So the dog felt normal now. 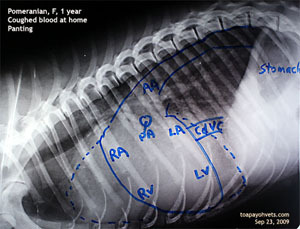 As the duration of action is 6-8 hours, I got the Pom X-rayed 4 hours later by Vet 4. It was also good to discuss this case with him. 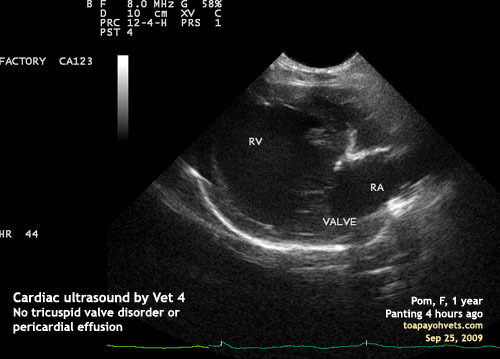 Vet 4 proposed cardiac ultrasound to check whether there was pericardial effusion which could be treated via ultrasound imaging. 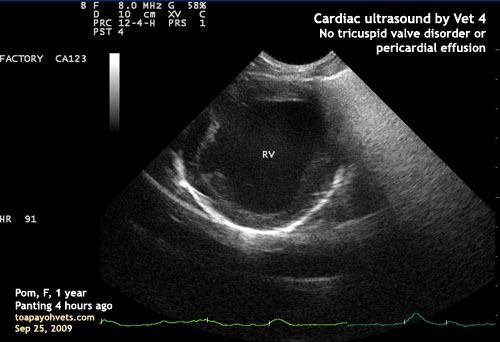 Also, ultrasound could reveal any disorder of the tricuspid valve. "Would the Lasix resolve any pericardial effusion?" I sought his opinion. He nodded his head. 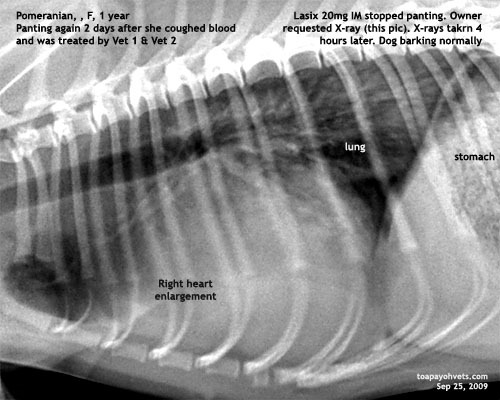 He had one case of success in draining the pericardial fluid from a dog who is still alive. "The owner is concerned about the cost, saying she had spent $800 at Vet 1 and 2." Now, X-rays and a cardiac ultrasound could add up to $400. Vet 4 reduced his fees while I forgo my consultation fee so that this Pom could get the ultrasound done. His fees were a low $171.00. I appreciated his kind gesture and agreeing to X-ray despite the fact that Vet 1's X-rays were good. I charged $96 for the medications. The owner had spent nearly $1,000 which is a large sum for a young lady. The dog went home on a strict advice to stay at home and 3-hourly medication for the first week and communication with me. No more fun and exercise at East Coast Recreation Park. "How log will this dog live?" I asked Vet 4. "Vet 2 had said up to one year." "Vet 2 is a bit too optimistic. This dog is unlikely to live past his 2nd year birthday." The lady owner was extremely sad that there was no cure or drug to reduce the size of the right side of the heart. Her dog was a living time-bomb. This was a young dog. A present from her boyfriend. With no more outdoor activity, strict compliance to taking drugs, a proper diet and giving medication when the dog started panting past midnight, the Pom is still alive at this time of my record today, Sunday Sep 27, 2009. It is only 7 days since the Pom coughed out blood, but there was no more horrible panting episodes now. The heart medication was running out. The young lady owner was quite happy compared to 7 days ago. The Pomeranian looked normal and had gained weight. Strict compliance to giving of drugs was the reason for success. The battle is won but the war of the congestive heart failure is not over. In the past 7 days, this was done. Every 3 hourly, 3 mg of Furosemide (10 mg/ml given at 0.3 ml) was given without fail. Every 12 hours, 1/4 tablet of Fortekor 5 mg tablet. Dog was not allowed outside the apartment. "Dog was breathless when let outside to the corridor," the young lady now stopped her dog from venturing outdoors. "At 4 pm, the dog panted. Why? Was the drug ineffective?" We came to the conclusion that it was the boyfriend coming back from work at that time and the dog was excited to see him. Antibiotic syrup (once a day), multi-vitamin syrup (once a day), multivitamin paste (1 teaspoon twice a day) was also given. Vegetables and home-cooked food. Dog food pellets available at all times. Dog was said to pass thick urine. Overall, the dog was leading a normal life for the past 7 days. Furosemide at 5 mg every 6 hours has been proposed while Fortekor 5 mg will be given as before. Low salt diet. Potassium supplementation. The young lady and her family had saved the dog and nursed her back to good health. Heart drugs will not work effectively later and the young lady was informed accordingly to prepare for the worst. 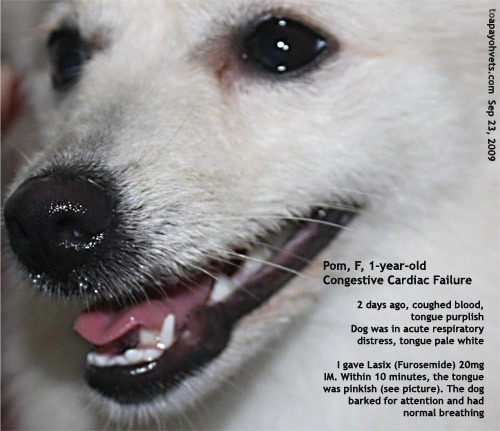 This Pom lived for around 1.5 years after diagnosis.